Available in sixresistance levels, the Healthstar Therapy Putty Hand Exercise Kit is designed for rehabilitation programs to strengthen the muscles in the hands. 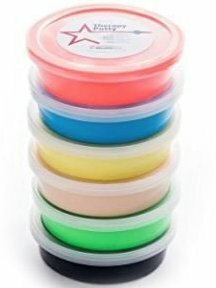 Made from hypoallergenic silicone, this therapy putty is unscented, non-toxic and doesn't feel sticky or greasy as it's pulled and kneaded. It is a particularly good choice for people with sensitivities to natural rubber and latex. If you have any questions about this product by Healthstar, contact us by completing and submitting the form below. If you are looking for a specif part number, please include it with your message.